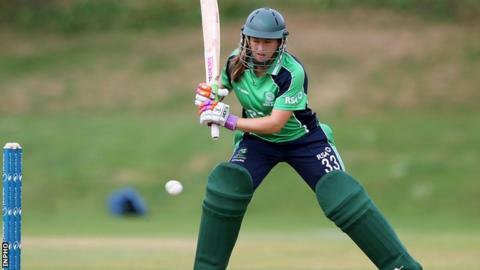 Ireland made it two wins from two by beating China by 28 runs at the ICC Women's World Twenty20 qualifying tournament in Bangkok. Ireland posted 104-6 from their 20 overs, a total China never did not threaten to overtake. Captain Isobel Joyce hit an unbeaten 41 off 36 balls, while her China counterpart Huang Zhuo was her team's top scorer with an unbeaten 39. Ireland play their final Group B against Zimbabwe on Tuesday. A win would see the Irish avoiding tournament favourites Bangladesh in the semi-finals, with Scotland the likely semi-final opponents. Zimbabwe beat the Netherlands by two runs on Sunday to maintain their 100% record. In Group A, Bangladesh beat Scotland by eight wickets and Papua New Guinea secured a seven-wicket victory over the hosts Thailand.